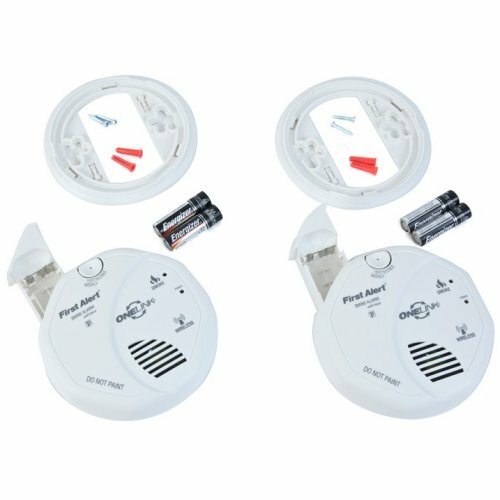 This may not be the exact model, but I bought 2 First Alert detectors at Costco for $23. Not a lot to installing any smoke detector, most have two screws that go into the ceiling and a cover that pops off so you can replace the 9v battery. Sounds easy enough, but getting the screws in the right place isn’t always simple and its always hard to remember how to pop the cover when you do the battery change (twice a year if you do it right). This one takes care of both problems. There is a separate base that fits a variety of existing screw patterns and if you don’t already have screws in the ceiling, you can just hold the base up and mark the location for the holes perfectly. Mount the base, then the detector gets fastened with just a simple quarter turn. The battery (AA below, but 9V in mine) is in a pull out tray. Pull out, change battery, push back in, done. It’s not a Nest Protect, but it works out to be $235 cheaper for the two (which doesn’t mean I may not buy one, just not today). Thinking you haven’t changed batteries lately? Go do it, you’ll sleep better knowing it’s done. I have Kidde smoke detectors that let you change the battery by just pushing on the little battery door and the whole thing lowers. Pull old battery out, push new battery in. Also, let me give my standard spiel about hard-wired smoke detectors. Smoke detectors should be replaced every 10 years. If your house is new enough to have hard-wired smoke detectors, replace them with hard-wired smoke detectors. They are networked so that if one goes off they all go off. That way if a fire starts in your basement you’ll know up on the second floor. Another plus is that new hard-wired smoke detectors have a battery backup so you can be alerted to smoke during a power failure. Agree wired is a better option, just not trivial to retrofit. Networking is part of what Nest does too, important to cascade the alert. Where it gets interesting is potentially doing things like shutting down the AC to slow the spread of smoke. I don’t know if it’s true everywhere (doubt it is) but in my area at least the fire department will come out and install basic smoke detectors (and carbon monoxide detectors too!) for free. And of course while they are at it they make sure you have enough and in the right places.